Do you drink one small glass of wine a day? Maybe you even have one day off a week? That’s just under the UK low risk drinking guidelines of 14 units a week. You know cigarettes increase your risk of cancer but what about a glass of wine each night? Isn’t that supposed to be good for you? Survey data suggests only 13% of people are aware of a link between alcohol and cancer. Well, unfortunately while moderate drinking is considerably less dangerous than heavy drinking it is certainly not without its risks, particularly for women. Alcohol causes at least seven types of cancer (breast, liver, gullet, mouth, throat and bowel), and while the risk increases the more you drink, all levels of consumption carry a cancer risk. Furthermore, there is now robust evidence that low levels of alcohol do not provide any protective health benefits. The cancer risk associated with alcohol is worse for women because for moderate levels of consumption, for example one bottle of wine per week, the alcohol-associated cancer risk is higher for breast cancer than other cancers related to drinking. Breast cancer is now the leading cause of cancer in women, 1 in 7 UK women will be diagnosed within their lifetime and 1 in 13 cases can be linked to alcohol. You would not be alone if this was news to you. Survey data suggests only 13% of people are aware of a link between alcohol and cancer. Several large studies have described the links between moderate levels of alcohol and breast cancer. The first was published over 15 years ago. Public Health England have released statements encouraging women to have more alcohol-free days to reduce their cancer risk and local awareness campaigns are running. However these are failing to address long held beliefs that moderate drinking is beneficial, and many people simply think cancer is caused by ‘something else’. This issue is not limited to the UK. On a daily basis women are exposed to alcohol advertising which is self-regulated and uses images which link alcohol with glamour, celebrity, having large groups of friends and starting new relationships. Drinks companies can advertise on TV, at the cinema, on social media, in magazines and newspapers and sponsor most high-profile sporting events. Previous research suggests that this is effective. The annual global marketing spend for the drinks industry is estimated at 1 trillion US dollars. Alcohol promotion helps establish alcohol as a normal commodity among consumers from an early age and ensures drinking remains firmly entrenched in the British culture, rather than being understood to be a Class 1 carcinogen. Compare this to smoking. Over 70% of the population understand smoking to be a major cause of cancer. Heavy taxes, advertising bans, plain packaging containing explicit health warnings, and a ban on smoking in public places has led to a decrease in smoking levels from 46% of the UK population (1974) to 19% (2014). These are all tried and tested effective public health strategies aimed at informing the public and thereby reducing harmful behaviour. Smoking kills up to two thirds of its users, is the single largest preventable cause of cancer worldwide, and is responsible for 3 in 20 cases of cancer in the UK, but how does alcohol compare? 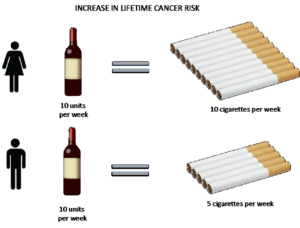 Using information already published on alcohol and tobacco we calculate that on average for women, drinking 10 units of alcohol (about a bottle of wine) a week carries the equivalent cancer risk to 10 cigarettes. For men the figures are lower (10 units is equivalent to 5 cigarettes) but still substantial. This gender gap results from the fact that low levels of alcohol consumption increase the risk of breast cancer to a greater extent compared to the other alcohol-related cancers, and the increase in cancer risks due to smoking are slightly greater for men for most other cancers. This study by no means detracts from the substantive risks of smoking, but simply uses well established public knowledge on smoking and cancer to try to improve understanding of the cancer risks associated with alcohol. It is not a comparison of the overall disease burden of smoking versus drinking. While tobacco-related cancer messages are typically supported by the media, the links between moderate alcohol consumption and cancer have been less well communicated. Often the only messages people routinely hear about alcohol are the ones promoted by the drinks industry. We hope our simple message expressing alcohol-related cancer risks in terms of cigarettes will help tackle the lack of public awareness of the relationship between alcohol and cancer, and better inform people to make judgments about the risks they wish to take with their own health. Dr. Theresa Hydes is a Clinical Hepatology Fellow at the University Hospital Southampton. She is interested in all aspects of hepatology, having completed a PhD in hepatic immunology, as well as publishing within the fields of population hepatology, inpatient early warning scores for patients with liver disease and viral hepatitis.